Becoming a homeowner doesn’t equip you with the basics of household know-how, although time and experience will likely teach you how to tighten up a leaky faucet. But technicians say that up to 30 percent of their service calls require nothing more than the flip of a switch or the push of a button to ‘repair’ the stated problem. The fridge is warm. Check to see that nobody messed with the temperature dial. Turn it up if need be, and be sure no food containers are blocking the fridge and freezer compartment vents, which supply the flow of cold air. The bathroom lights don’t work. Sometimes all the bathroom outlets or several exterior lights are powered through a single GFCI (the red button in the middle of some outlets located in one bathroom). 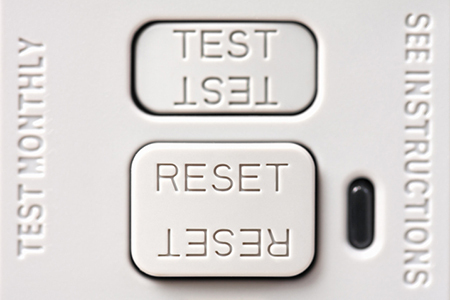 If there’s an outage, push the reset button on the GFCI, and you could be back in business. A kitchen appliance won’t turn on. When a light goes out in one room or a switch doesn’t turn on the coffeepot, check the main electrical panel for a tripped circuit breaker. Look for a switch that’s not in line with the others. Flip it fully to the off position, and then back on. The toilet is running. The most common cause is a worn flapper that no longer seals properly. The flapper is easy to replace without calling a plumber. Your nearest home store can sell you the part and tell you what you need to know. The paint needs a touchup. Mimic the texture a paint roller leaves on the wall without calling the painter. Dip an old washcloth in the paint, dab it on the spot, and toss it away. The garage is stuffed. Before you call a carpenter to add more shelving, mount a section of wire shelving to the undersides of the beams to give you a row of neat storage nooks. Unlike solid shelving, wire lets you see what’s up there. Then pick up a pack of S-hooks at a home center, and turn a length of wire shelving into a rack for holding garden and/or cleaning gear. Interested in more home improvement tips? Feel free to contact me directly.